Reckless Racing 3 Apk + Mod + Data Is Racing Game . Price in google store is 2.89$ . In this game Play the Career and Arcade and Single Event game with 24 challenges . play DRIFT MODE & GYMKHANA & RECKLESS MASHUP . more than 28 cars and 36 routes . Download Reckless Racing 3 For Android With Data From RevDL With Direct Link . 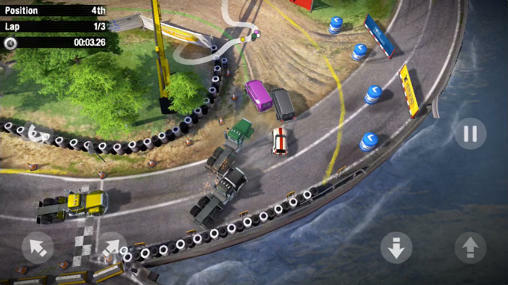 Reckless Racing 3 is an exciting game in the genre of racing games. it has the best power slides, customizable touch controls, complex graphics and more detailed than before. you can choose from 28 cars and trucks. it has 3 modes: career, arcade, single event. you can play the career mode loaded with 60 events in 9 different seasons, the Arcade mode featuring 24 challenges, or compete on the online leaderboards in Single Event. Do i place it in android/obb on the phone storage or on the sd card? i have data of 1.1.7 version… i need to download all again or not? Why my download never starts from this site. Im uaing uc browser in phone and i tried in pc too .. Plz help !!! Does this version has a multiplayer? What is the name of the data? Where I place data file? On android/obb or android/data?